Damaraland lies just to the south of Kaokaland and the region is dominated by an incredible array of geological phenomena from the impressive Brandberg Mountain to the pointed inselberg at the Spitzkoppe, while Twfelfontein is also home to arguably the most famous collection of bushman rock art. But I like coming here to search for and photograph the amazing desert-adapted elephants and black rhinos that reside in this harsh terrain. Visits during the late dry season usually prove the most fruitful as these large mammals are driven by thirst to make use of a handful of waterholes located within the region’s dry riverbeds. This makes locating and observing these usually wide-ranging behemoths considerably easier. The area is a true wilderness and to sit quietly and watch a herd of these uniquely-adapted elephants slake their thirst or munch on the spindly vegetation of this arid realm gives me an incredibly energising feeling and connection with nature. Damaraland is a place for true wilderness and elephant lovers; however, if you’re primarily after the charismatic cats then I would probably give it a skip. 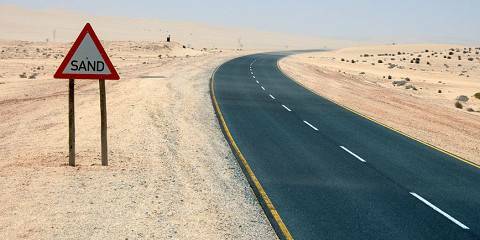 On a map, the region known as ‘Damaraland’ encompasses a vast chunk of northwestern Namibia. In tourist terms, however, it is generally held to be the area south of Kaokoland and north of the Namib-Naukluft. Here, the semi-desert terrain is punctuated by dry rivers, sculpted rock outcrops and the Brandberg massif, forming perhaps Namibia’s most alluring landscape. Unsurprisingly, Damaraland’s attractions are as much mineral as animal, and include the ‘organ pipe’ dolomite formations, a petrified forest and fabulous San rock art at Twyvelfontein. Large game is thin on the ground; I saw a few gemsbok and springbok, and saw the tracks of the famous ‘desert’ elephants, which sometimes wander south from Kaokoland. The smaller wildlife is fascinating, however: hiking around the spectacular volcanic inselberg of Spitzkoppe, I encountered such local specials as dassie rats, sand snakes and the endemic Herero chat. And at my campfire, with a vast canopy of stars and a background chorus of barking geckos, I enjoyed that special brand of wilderness isolation that Namibia has made all its own. What’s more, I did it all in my own humble Toyota Corolla. Damaraland is a photographer’s dream – with its stunning rocky, desert landscapes, contorted rock formations and huge flat-topped mountains. It is a harsh, unforgiving place, with miles and miles of “nothing” except wilderness and silence. At first glance Damaraland appears devoid of much life, but it is extraordinary the variety of wildlife that manages to survive here. Top of every visitors’ wish list are the desert elephants – it’s truly astonishing to see them plodding across the shimmering landscapes. I also spent a day tracking black rhino. Finally, after 8 hours with my guide, one appeared from behind a euphorbia bush, looking like a dinosaur in the heat haze. You can also hope to see photogenic giraffe, oryx and springbok. Damaraland has a number of endemic bird species too – including the Ruppell’s korhaan, with its frog-like croak. Some lodges in the north of the region also offer visits to the semi-nomadic indigenous Himba people. Just south of Kaokoland, Damaraland is equally barren and a must for those who like to get off the beaten path and experience remote Namibia in all its glory. The undulating, rugged semi-desert landscapes are striking and always make me feel strangely melancholic, and the flora and fauna, though not always abundant, are fascinating. 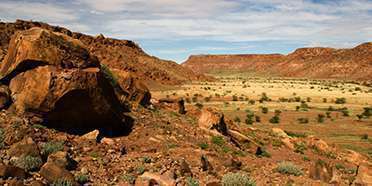 In particular, Damaraland is known for its black rhinos and desert-dwelling elephants, though both can be hard to find. I’ll never forget the experience of tracking rhino on foot, even though we didn’t actually see any in the end – the sense of total wilderness and the big skies were enough. Seeing elephants in this environment, or any other wildlife for that matter, is equally unforgettable, in part because it seems so unexpected that anything can survive here. Damaraland also has some of the best eco lodges and camps to be found in Namibia, and fascinating archeological sites like Spitzkoppe, both of which help make the overall safari experience about much more than just wildlife. One of the absolute wildlife highlights of Namibia is the rocky and predictably arid region known as Damaraland, home to one of the world’s few populations of desert-adapted elephant, as well a local subspecies of black rhino. My first sighting of a herd of elephants marching through this unpromising terrain, below dramatic black cliffs, will stay with me forever, as will the rather bizarre sign of their tentative attempt at crossing one of the reserves normally dry watercourses after a rare flash flood. Aside from elephant and rhino, there isn’t much variety of wildlife on offer here, but the wilderness atmosphere more than compensates. I always enjoy Damaraland’s uniquely striking landscape; the gravel plains are dissected by sandy dry riverbeds and give rise to flat-topped hills and unusual eroded stacks of giant boulders known as inselbergs (‘island mountains’). It encompasses some of Namibia’s most dramatic natural features such as the massifs of Spitzkoppe and the Brandberg while the red-hued rocks at Twyfelfontein shelter Namibia’s largest collection of San rock art. Although not a typical wildlife region, the highlight for me is seeing (desert-adapted) elephant; most memorable was watching a huge male gleefully rip massive shards of bark from what seemingly appeared to be the only tree in the valley. I’ve also spotted rare raptors including the Peregrine falcon and booted eagle, and springbok are plentiful (as are goats and their goatherds). On my drives through the region, the gravel roads have been fairly well-maintained and there’s a good choice of lodges and campsites. I set out to Damaraland to find the desert-adapted elephants. Desert-adapted elephants really look like any other elephants, but seeing these giants in this rugged, rocky terrain was an amazing experience. With little food and water around, the elephants seem to be permanently moving and finding them can be a challenge. 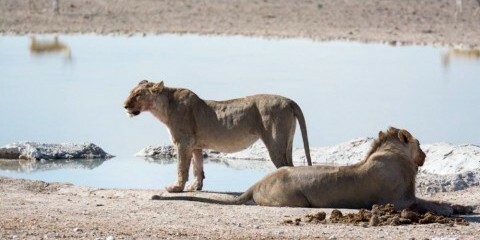 We eventually found them feeding next to a dry riverbed. Many of the rivers in the area only flow once every few years, but this was a wet year and rain seemed to be following us around. This was the first and only time I witnessed a flash flood. Out of nowhere the water started running through the bone-dry riverbed. I was obviously not the only one who had never seen this before. I expected the thirsty elephants to love this sudden abundance of water. I expected the youngsters to play in the river, as they usually like so much. But the elephants were watching the river with suspicion. A few hours later, after a lot of deliberation, they crossed the river. The youngsters seemed to need a lot of convincing from the adults and after a quick drink, they left the river behind. Wildlife densities are low in this area, but aside from the elephants, you might see other ungulates like giraffe, kudu and steenbok. Black rhino is present, but rare to see. Few places in Africa have surprised me in recent years quite like Damaraland. For a start, there’s the wildlife. Desert-adapted elephants, rhinos that you can track on foot, lions, spotted hyenas, zebra, giraffe, leopard…the only missing card in the Big Five pack is the buffalo. But it is the rhino that defines Damaraland, an epicentre for rhino conservation with fabulous conservancies and tented camps providing a supremely comfortable base for getting out to track this ancient species. But I’d also rank Damaraland as one of Namibia’s most beautiful corners, an astonishingly beautiful land of red sand, great, bouldered mountains that take on weird and wonderful forms, and picturesque dry watercourses. Put them all together and Damaraland surely offers one of the most dramatic backdrops for any safari anywhere on the continent. And don’t let the absence of a national park deter you – this is one of the most exciting safari destinations in the region. Damaraland, in west central Namibia, is one of the best places in Africa to go rhino-tracking on foot – an activity that’s not just laid on for tourists, but is a daily routine for the region’s professional rhino conservation workers. The region’s black rhino population are kept under constant surveillance as part of an ongoing drive to keep poachers out. In my experience it can be just as hard keeping up with the trackers as with the rhinos, but there’s a very good chance of being rewarded with a sighting. There’s nothing quite like seeing a rhino moving through this beautiful, arid wilderness, even if it’s just a brief, distant glimpse. 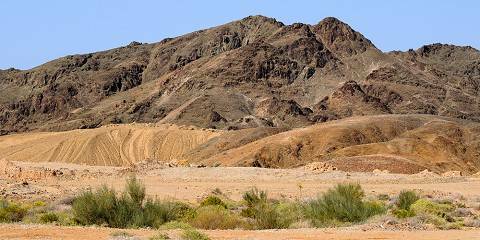 Damaraland also has beautiful semi-desert landscapes: richly-coloured slopes and plains dotted with weathered rocks and drought-resistant plants. One of the most unusual is the straggly-looking welwitschia. A surprising variety of wildlife species survive these harsh conditions, too. Desert-adapted elephants patrol the dry river beds, prospecting for water, and you may also see antelopes, giraffes, zebras, ostriches, and endemic birds.